I’ll never forget my first proper bike, it was a BSA Streaker, yes, Streaker, which according the older kids in the village, who knew everything, was Spanish for naked. Who was I to question their knowledge of foreign tongues? I had a bike that said ‘naked’ on the down tube, and there wasn’t a day I wasn’t reminded of this. I didn’t care, though — my bike was exotic, it wasn’t a standard Raleigh, it had three gears, and more importantly it had drop handlebars. It was a proper bike. So to the present. My daughter was about to turn six, she’d grown out of her baby bike and it was time for the next step on her two-wheeled odyssey. My wife started to search the usual outlets and we’d found one we both agreed would be OK, but it just wasn’t quite right — there must be another option. By chance that week, while racing at Herne Hill velodrome, one of the many kids who ride there rolled up on what looked like a perfect miniature track bike. It was amazing. I had to see who made it. The name on the down tube was ‘Islabikes’. I rushed home. I’ve seen the perfect bike, I proclaimed! I’m going to buy her a mini-track bike and she will be the only six year old riding fixed to school. She will be beyond cool. Of course, I was given a harsh reality check so I checked out the Islabikes website to see if they had something more practical. As it turned out, Islabikes makes a bike for practically every sized rider from the ground up. All I had to do was measure my girl, cross-reference the handy sizing chart and pick the model that best suited her, then pray they made it in hot pink. After weighing up the cost — and they aren’t cheap — versus the how-long-it-will-last-her equation, I chose a Beinn 20 large. A few days later the bike arrived at the office. The postman passed me the box and as it was a fair size, I braced myself to take its weight. And here was the first of many surprises. Including the box, it must have weighed half as much as her last bike, which was half its size, As any parent of young children will know too well, the weight of your child’s bike is crucial because when they get bored, change their mind etc, it will be you who has to carry it. I pulled it out of the box to gasps of, “Look at that!”, slotted the front wheel in, attached the pedals and in no time it was fully built. I stood it in front of me with an excited smile on my face. It was beautiful, it really was a proper bike! 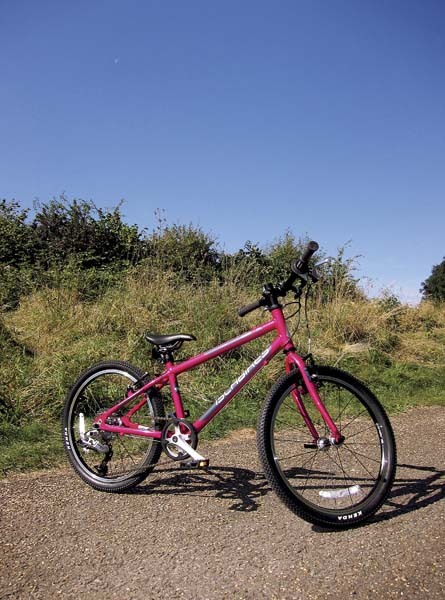 The Beinn 20 oozes quality from every inch of its perfectly proportioned, sparkling fuchsia frame. Shimmering in the sunlight, decked out in modern, refined, slick graphics, it was the stuff of dreams. Once past the dazzle of the paint you then start to notice the details. Narrow alloy rims shod with neat Kenda tyres. The smooth alloy hubs complete with real-life quick-release! I was 17 before I had a bike with quick-release hubs. Next my eyes were led to the impressive looking SRAM X4 rear derailleur running the chain across a set of 12-32t sprockets that should ensure my girl will cope with any terrain. 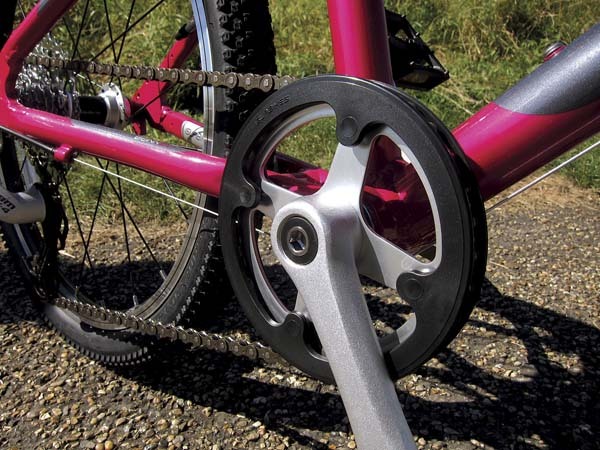 At the front the simple, single chainring is shielded from the rider’s shins by guards either side making it perfectly practical yet still stylish and minimal. I’ve yet to see a decent saddle on a kid’s bike, that is until now. I’d be happy to have it on my race bike if it was just a bit bigger. So we’ve established it looks the business, but how does it ride? A couple of days later it was time to hit the road. Even though it’s roughly twice the size of her previous steed, my daughter was off straight away, and she loved it. We tried the Tektro V-brakes, and they were wonderfully smooth and easy to pull thanks to the special short-reach levers. Next, it was time to change gear. This proved a little trickier as she’d never had to do it before and we started by stopping each time she wanted to change. The grip shift was simple to use, but she did have to struggle a bit to change down the sprockets as it needed a little more strength and a slightly different technique — but this will come to her. Handling was perfect: she was able to keep it in a straight line while jabbering away. The attention to detail on the bike is verging on the obsessive. Everything has been carefully considered, perfectly chosen and expertly arranged to make the perfect package; from the feel of rubber on the grips, the neatly routed cables, to the bosses for a bottle cage and those oh-so-special quick-release hubs. 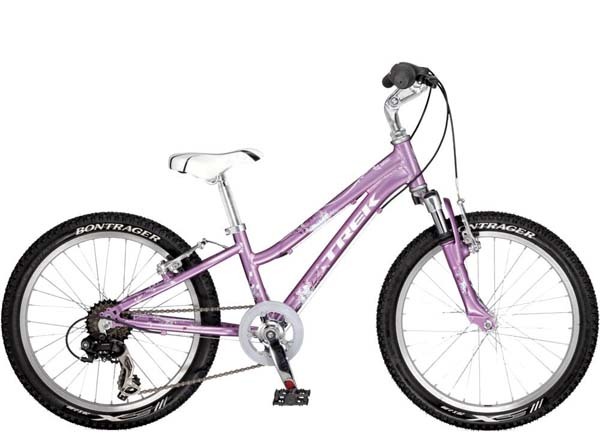 This is the bike we were originally going to choose. It has the same size frame as the Beinn 20 and appears to be very similarly kitted out with nice-looking V brakes, a Shimano TX30 rear mech and alloy rims. A stand-out feature is the Suntour suspension fork, which packs 30mm of travel to help smooth the bumps off-road. Also, the low crossbar makes it very easy to mount and dismount for little legs. With quality finishing touches from the likes of Bontrager it’s certainly the real deal, and most importantly it’s pink.